I just love reading anything by C. S. Lewis. I like reading about him, too, and I've done a fair amount of that. From the Library of C. S. Lewis: Selections from Writers Who Influenced His Spiritual Journey is a new way to experience Lewis. 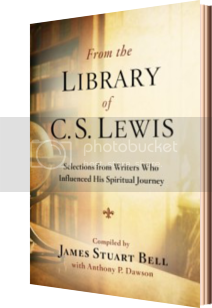 Compiled by James Stuart Bell, this book is arranged topically, and each topic contains a number of short excerpts from authors who impacted C. S. Lewis. I'll confess that reading the description of the book didn't exactly leave me knowing what to expect. C. S. Lewis was one of the most influential thinkers and writers of the twentieth century. But who influenced C. S. Lewis? What were the sources of his inspiration? Who were his spiritual mentors? Drawn from Lewis’s personal library, annotations, and references from his writings, this book includes more than 200 selections from literary giants such as Dante, Augustine, and Chaucer, as well as more contemporary writers such as G. K. Chesterton, Dorothy L. Sayers, George MacDonald, and J.R.R. Tolkien, providing a vast array of inspiration from those who have shone forth as messengers of light in Lewis’s own thinking, writing, and spiritual growth. Gilbert Keith Chesterton (1874-1936) -- Roman Catholic artist, poet, journalist, essayist, and author, Chesterton wrote over one hundred books. C. S. Lewis says, in Surprised by Joy, that Chesterton's Christian apologetics had a marked impact on him, and Lewis's own apologetic work owes a debt to Chesterton. I have really enjoyed reading through this book. I tend to flit around, not reading it straight through. I'll read the bio for a selection, then go back up to the beginning and read the selection itself. Sometimes that sends me back to the index to find out if there are more works from that author included. Disclaimer: I received this book for free from WaterBrook Multnomah Publishing Group in exchange for this review.